OM was alive and well at this year’s Mission-Net Congress from 28 December – 2 January in Offenburg, Germany. The Mission-Net Congress is a pan-European gathering of nearly 3,000 Christian adults for training, encouragement and missions mobilising. At OM’s Global Village, over 1,300 participants flew to Harvest on more than 160 flights. Harvest, a carefully constructed simulation of needs such as poverty, imprisonment, and prostitution, is designed to create awareness and propose ideas of how to respond. It’s like a mini mission trip without leaving the Mission-Net grounds, complete with full debriefing, prayer and opportunities to talk with experienced missionaries. George was the main speaker at the Mission-Net New Year’s Eve meeting, giving out close to 1,000 free books in multiple languages after his talk. Together with the OM bookstore, open throughout the congress, this totalled 7,000 books, 2,000 Jesus DVDs and 2,000 New Testaments, all given for free. 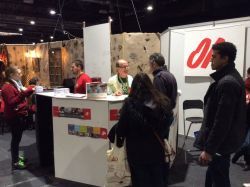 In another area, the OM booth saw 85 people from 22 different countries sign up to receive more information on short- and long-term opportunities. Many great conversations were had and those working at the stand were encouraged to see people respond to God’s call. Fulfilling a very practical need, OM Germany and OM Ships ran the kitchen with 26 staff, providing three meals daily for 2,800 people. From chicken to pasta, participants were fuelled up and satisfied with delicious food. Whether at Global Village, the OM booth, the OM bookstore, or the kitchen, OM counted it a privilege to be involved at Mission-Net.